Shamorie Ponds breaks through Creighton's defense. @StJohnsBball. 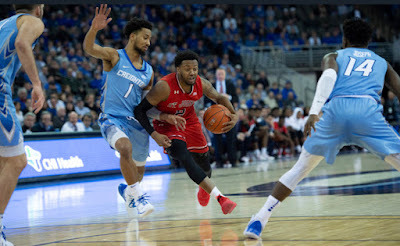 On Wednesday night, St. John's and Seton Hall each got big wins that saved their seasons, as St. John's ran out Creighton on the road, 83-67, an Seton Hall outlasted Providence, 65-63, in Newark. Both schools improved to 4-5 in Big East Conference play and moved into third place behind Villanova (8-0) and Marquette (8-1), breaking out of the pack of 3-win teams (Georgetown, Creighton, Xavier, Providence, Butler, and DePaul). St. John's had a dispiriting loss to Georgetown on Sunday at Madison Square Garden which left them questioning their identity and if they can find the early season magic. "We know what we are capable of. We don't have to prove to anyone out there. We are going to go out there and play our game. There is always going to be someone who has something good and something bad to say. We just have to stick to our game plan." Wednesday night in St. John's showed what they can be, as they were led by Ponds, who poured in 26 points on a superb 10-17 shooting, including 4-8 on three-pointers, with 8 assists and 8 rebounds, narrowly missing a triple-double. Mustapha Heron had a nice game, shooting 7-12 from the field (1-4 on threes), with 7 rebounds and an assist. LJ Figueroa has 15 points (7-11 FG, 1-5 threes), 5 rebounds, and 3 assists. The biggest surprise for St. John's was that Brian Trimble, Jr. had a season-high 11 points (4-6 FG, 3-5 threes), 4 rebounds, and 2 assists in 33 minutes off the bench. Trimble's prior season high was 6 points, which he did twice (against Mount St. Mary's on December 5 and against Sacred Heart on December 22). He was held scoreless in their prior three games. Trimble Jr. said of his performance, "Whatever my team needed, I tried my best to take care of it. I made shots. I saw it in myself and being able to do that is a confidence builder." This was the second time in two weeks that they ran out Creighton, as they beat them 81-66 at The Lou (credit Josh Adams of College Hoops Digest) on January 16. St. John's shot 57.9 percent (33-57) in this one, and held Creighton to just 41.7 percent, or 25-60. Seton Hall entered this one on a four-game losing streak, and specifically, an 80-52 drubbing at the hands of Villanova on Sunday. Myles Powell stepped up big time, as he led the way for the Pirates with 31 points on 12-23 shooting, including 3-7 from behind the arc, with 4 rebounds and 2 assists. Seton Hall Head Coach Kevin Willard said of Powell, "I think the biggest thing is I told the team the other day, I'm like, 'Guys, we can't go five minutes without Myles Powell touching the ball.' I said we got here riding his back. I said, 'Let's not play make-believe. This is the guy that's gotten us here,' and there were times where we were going too long without him touching the basketball. And I thought he came out from the start being aggressive, and I thought that really set the tone. I just thought it was big the way he set the tone coming out and being aggressive." Michael Nzei had 12 points on 4-5 shooting, with a rebound; Quincy McKnight had 9 points (4-7 FG), 4 rebounds, and 3 assists; and Taurean Thompson had 8 points (3-7 FG) and 9 rebounds, narrowly missing a double-double off the bench. The Hall led this one 34-27 at halftime, but Providence opened the second half on a 20-6 run capped by a Nate Watson layup to take a 47-40 lead with 14:02 left in the second half. Seton Hall battled back, pulling within two, at 51-49, on a Powell layup at the 9:48 mark, and a Powell three-pointer gave them a 56-55 lead with 7:31 left. Providence took a 61-58 lead on a Nate Watson jumper with 3:42 remaining, and they were held to just two points (Isaiah Jackson free throws at 1:34) the rest of the way. At the 2:56 mark, McKnight got a layup, was fouled, and then hit a free throw to complete the three-point play to make it 63-61 Seton Hall. The play of the game came from Powell at the 1:47 mark, as he had a steal followed by an electrifying dunk to make it 65-61. Willard said of the anticipation from Powell on his big play, "Again, I just think his sense of urgency tonight on both ends was great. I thought playing the 39 minutes he played, at the level that he played, just showed how much this meant to him." Willard said of Seton Hall playing through adversity, "We got down seven. and Mike Nzei and Myles Powell were very vocal about how it's not now or never, but it's a pretty important time. They were both extremely vocal in the last -- I think we called the under-16 timeout -- I think I called timeout at 17 -- they were just kind of extremely vocal about it, and they stayed vocal throughout the whole game."